On the morning of 19 January 2004, MV Rocknes left the port in Eikefet, just north of Bergen in Norway. After a stop west of Bergen in Skålevik for bunkering, MV Rocknes continued her journey southwards. Later on, at about sunset, when the ship was entering the narrow sound Vatlestraumen, she grounded on the starboard side of the fairway, took in water and capsized a few minutes later. 18 lives were lost in the accident. In a subsequent legal action brought by the shipowner and insurance companies, Oslo District Court held the Norwegian Government liable for approximately 3 % of the total claim, mainly based on an alleged error in an older version of the sea chart for the area in question. SSPA was engaged by the Norwegian Government to investigate the course of events in connection with the appeal hearing by the Oslo Court of Appeal. MV Rocknes was a flexible fall pipe vessel serving the offshore oil and gas industry. One of the vessel’s main tasks was to cover oil pipes on the seabed with stones, or gravel, which the vessel carried in its cargo holds. On the day of the accident, the vessel was fully loaded with stone material of different qualities in the six cargo holds and the transversal stability was low. After having experienced severe heel motions and subsequent cargo shift in the turn at Bernestangen, she eventually moored in Skålevik, south of Bergen, to bunker. The vessel left Skålevik and headed south under the Sotra Bridge. After having made a port turn into Vatlestraumen, she hit a ground outside Revskolten lighthouse, took in water and capsized. 2. Establish the importance of the loading condition for operating the ship. 3. Establish whether any divergence from applicable rules on stability and loading had contributed to the casualty and if so, to what extent. 4. Highlight the decisions taken on board the ship in connection with loading at Eikefet and sailing towards the capsize location at Vatlestraumen. Sketch showing the course of events before the grounding and capsize of Rocknes. One important task in SSPA’s investigation was to determine the loading condition of the vessel on the day of the accident. The loading of the vessel and the resulting stability of the ship was essential to the vessel’s behavior during the voyage, grounding and the ultimate capsize. After the accident, police hearings with witnesses and survivors were carried out. Later on, a maritime inquiry was also held. SSPA was given access to the numerous reports that resulted. These reports, together with technical documents and drawings of the construction of the ship, provided the basis for SSPA’s investigation. In order to identify the most probable loading condition, based on the available information, simulations of the course of events were carried out for different parts of the journey from Eikefet to Skålevik. In particular, the port turn at Bernestangen, with reported cargo shift and a permanent list, was investigated. The cargo shift was a result of an unsymmetrical loading of the cargo. 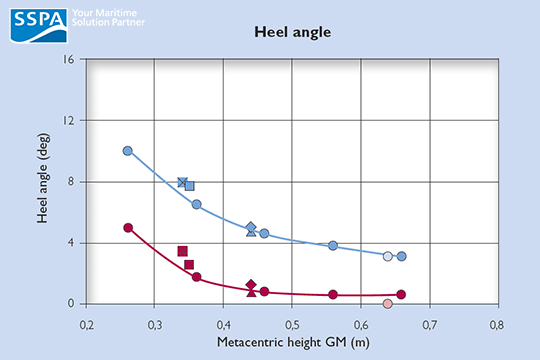 Together with load condition calculations, successive simulations with comparisons to witness information regarding the experienced heel angle, resulted in a span of probable loading conditions for MV Rocknes. The simulations were carried out using SSPA simulation software, SEAMAN, and the load condition calculations from the stability program, NAPA. MV Rocknes stopped at Bergen for bunkering on its way out to sea. By chance, the ship was photographed during the time it was moored. The photographs were taken for maintenance reasons, in order to document the quay. One of the pictures happened to show the portside draught marks. The photo of the draught marks is quite important, since it reveals that the draught was just at the maximum allowable load line. However, it is not possible to draw any definite conclusions from this, since neither the vessel’s heel nor information on any loading or unloading was available after the picture was taken. Picture illustrating dynamic and static heeling angle following the simulated turn and cargo shift at Bernestangen with different loading conditions. Just before the accident occurred, the vessel made a port turn as it approached the narrow sound of Vatlestraumen. However, the end of the turn took place south of the white sector from Hilleren Lighthouse, which lies outside the safe navigation channel. MV Rocknes was thus too far starboard in the channel, close to the island of Bjorøy, and it hit some rocks. The hull was breached and three tanks began to flood – damage was severe. The damaged tanks were large wing tanks; two of them were located adjacent to each other at mid ship and the third one was aft. Using an estimate of the amount of cargo, it was possible to calculate the actual flooding scenario at the time of the accident. The calculations confirmed that capsize was inevitable. Dynamic simulations were also performed. The results from the simulations were compared to GPS data that was recovered from the ship’s bridge after the accident. This comparison revealed information about the size of the holes in the tanks and the rate of flooding. The holes resulting from the grounding were modeled in SEAMAN, together with the subsequent internal flow of water to the damaged tanks. 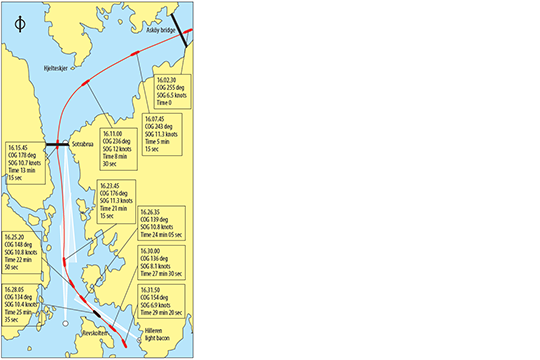 The entire voyage, from Skålevik until the capsize occurrence at Revskolten Lighthouse, was simulated using information on the actual load condition following bunkering, the grounding, inflow of water and capsize. The simulations were based on the time schedule outlined in the figure above. Studies have shown that human error is the cause of as much as eighty percent of all accidents. However, blaming an accident on human error might still conceal the actual root causes. In accident investigations, it is thus important to identify the basic causes, since they reveal where systems have failed, and thus what action should be taken to prevent future accidents. The following is a summary of the method used to analyze how the human factor contributed to the grounding of the MV Rocknes. Human error is a deviation from accepted norms, which are primarily found in regulations and instructions. Thus, human error can be assessed by determining whether regulations or instructions were followed (i.e. breaking the rules). If this type of error results in an accident (or incident), the breaking of the rules is the immediate or direct cause. However, further analysis is necessary in order to discover why the regulation was not followed, i.e. to find the basic (or underlying) causes. In maritime accidents, common basic causes are lack of situation awareness, risk taking, complacency and fatigue. It is also possible to take the analysis one step further by including the shore management’s (the Company’s) role as regards its responsibility to develop, implement and maintain a safety management system (SMS) as per the International Safety Management (ISM) Code. Actions relevant to the navigation of MV Rocknes during her voyage from the loading port to the grounding were analyzed. The only surviving person on the bridge was the pilot. His account was compared to the accounts given by other survivors and outside witnesses. An assessment was made as to whether there were any deviations from the regulations and if so, what consequences resulted from that. The assessment also included consideration of other factors, such as the vessel’s stability, maneuvering characteristics and visibility from the bridge. In conclusion it can be said that in the MV Rocknes’ case critical events emerged from the combined effects of technical and/or environmental factors and human actions, which together resulted in the accident. In the ruling from the Oslo Court of Appeal, the Norwegian state was completely cleared of liability.